Donald Trump has announced plans to discontinue birthright citizenship - the automatic granting of American citizenship to all babies born in the US - for the children of illegal immigrants. The president's proposal is likely intended to rally his supporters to vote for Republicans in the midterm elections, as well as antagonise Democrats and the mainstream media, but it's a suggestion that deserves consideration. Birthright citizenship is enshrined in the 14th Amendment of the US Constitution. A key reason for its ratification by Congress in 1868 was to enfranchise African-American slaves who were denied any form of citizenship in many southern states. The vast majority of this group was brought to the US against their will, and the government decided to protect their rights and recognise their humanity and equality by granting citizenship to them and their children. In contrast, most illegal immigrants voluntarily come to America for economic, cultural or security reasons. 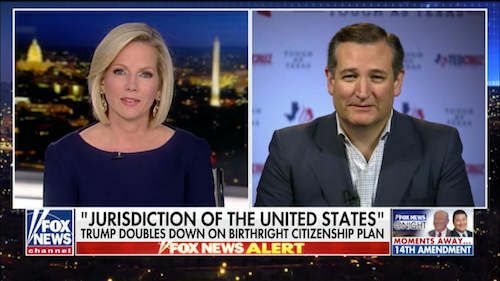 Birthright citizenship creates a powerful incentive for foreigners to enter the country illegally and have children who automatically become American citizens. It's a significant issue: illegal immigrants in the US have up to 400,000 babies – 8% of births nationwide - each year. States that are more welcoming to immigrants, such as California, have become hubs for ‘birth tourism'. The current law also encourages 'chain migration', when the American children of illegal immigrants sponsor their parents and other family members, enabling them to legally move to the US and apply for citizenship. These trends cost America up to $135 billion annually. Trump has threatened to eliminate birthright citizenship for illegal immigrants through executive order, but many legal experts argue he can’t alter the law unilaterally. He has dubiously claimed the 14th Amendment doesn't apply to illegal immigrants as they aren't "subject to the jurisdiction" of the US - which would mean those that commit crimes couldn't be prosecuted by the US government. Trump might be able to sign an executive order to "specify" the 14th Amendment to exclude illegal immigrants, but a Supreme Court ruling is needed to determine the extent of his power in this domain. Given Trump’s penchant for painting immigrants as violent criminals and disdain for people of colour, his critics argue his desire to end birthright citizenship for illegal immigrants is rooted in nationalism and racism. They fear his larger goal is to erase the citizenship of past immigrants and prevent the children of future legal immigrants from becoming American citizens. Those acts would violate the spirit and letter of the Constitution, and should be rejected outright. However, a revision of the 14th Amendment that excludes the children of illegal immigrants from birthright citizenship but grants them a right to appeal, passed by both Houses of Congress rather than executive order, could address a genuine problem and prevent the continued abuse of a legal loophole. Repeated exposure to Trump’s ignorant, insulting and often deceptive rhetoric has trained his critics to instinctively oppose his policies. Although his dislike of birthright citizenship may well be rooted in bigotry and xenophobia, it's one of his few proposals that warrant serious discussion. A careful change to the law, addressing the problem without infringing on the rights of legal immigrants, seems justified.